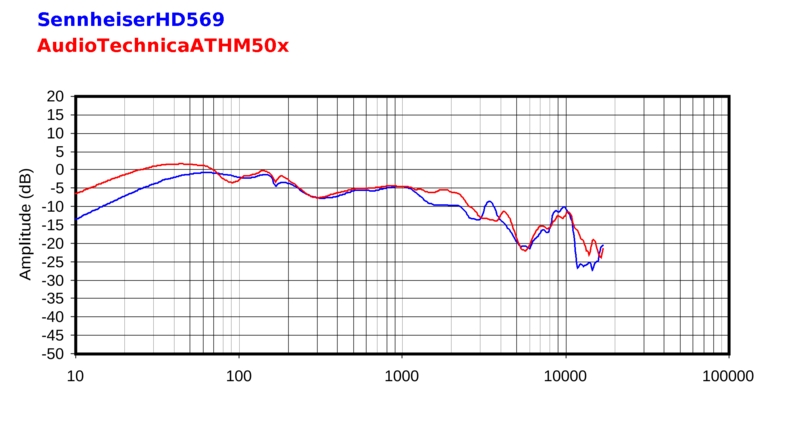 Raw frequency response plots show the HD569 is sensitive to a good seal for bass extension; it's likely these cans actually have better bass extension with a seal on the human head as I heard the bass extension as a little better than measured. 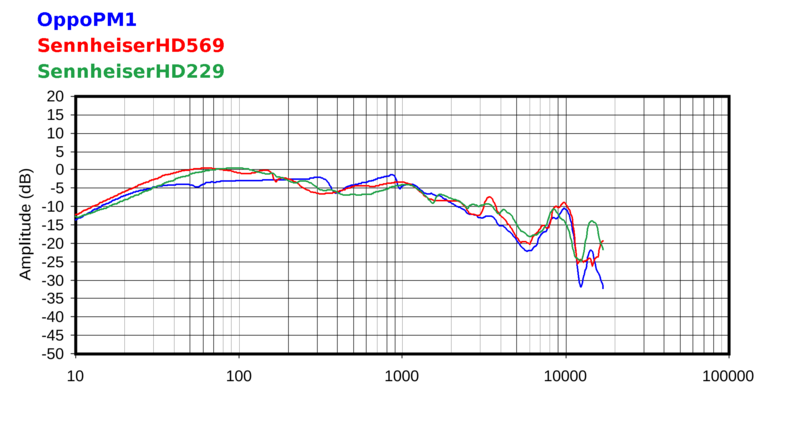 On the other hand, treble fluctuations surprisingly modest above 6kHz. Bass response is a broad hump centered at 60Hz about 7dB above the midrange response where bass hump returns to baseline at about 300Hz. A moderate pad bounce feature can be seen at ~160Hz. The midrange rise is a little abrupt from 300Hz to 600Hz and then flattens out before a fairly steep rise starting at 1.5kHz. Bottom line here: this curve, while fairly smooth, is also a litte bent out of shape emphasizing the 500Hz-1kHz area and de-emphasizing 1kHz to 3kHz, giving vocal fundamentals and lower overtones a little more emphasis than the higher overtones in the presence region and making vocals a little veiled sounding. Low treble falls off a too abruptly after the 3kHz peak and adds some loss of sparkle when heard. I have to say, however, I heard these features as less intrusive than I would have expected from measurements. 30Hz square wave has a fairly sway back shape and returns to zero before the end of the waveform, echoing the humped bass response in the raw response curves. Coupled with the rising THD below 150Hz we can see evidence of less than perfect response. I heard it as a bit blurry and lacking resolve, but the perceived bass level was quite pleasant. 300Hz square wave show some significan but clean ringing from the relatively sharp peak at 3kHz, and a gentle upward slope indicating a slightly rolled-off treble response. This ringing can also be seen in the impulse response where it looks a little dirtier due to higher frequency ringing likely from the peak at 10kHz. This kind of narrow band ringing at 3kHz and 10kHz is less intrusive than it might appear as it's occurring at natural frequencies for the concha bowl and ear canal resonances. Nevertheless, it's not as good as a well damped response; I heard it as a bit hazy sounding. 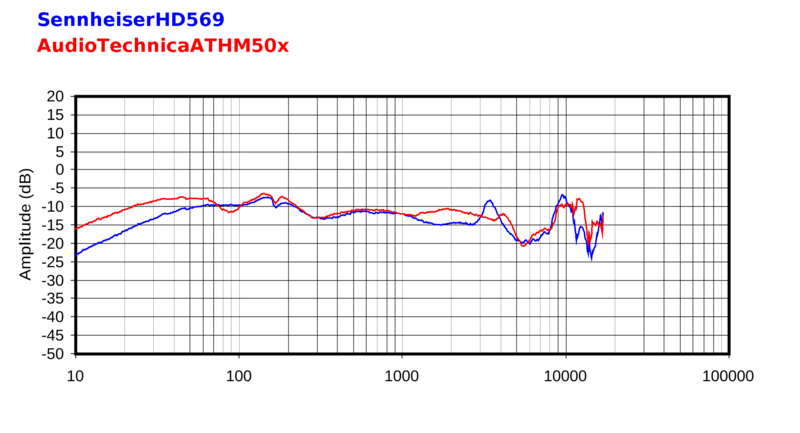 THD+noise is nice and low above 400Hz, but a clear rise in the bass is visible though not terribly excessive. I did hear the bass as slightly confused and blurry, but again, this was mild. Impedance plots show a nominally 33 Ohm headphone. The primary driver resonance appears to be at about 100Hz. While the impedance and phase curves do move around some, they look generally well behaved. Isolation at -18dB broadband is about average for a good sealed headphone and quite good for a low cost sealed can. With 56mVrms needed to achieve 90dBspl at the ear, the HD569 will easily reach solid listening levels for portable devices.